CVC words are a great way to practise combining sounds together. They also allow children to do so in a meaningful way. Find a list of CVC words here. Listed below are a number of CVC word ideas. Download and use Elkonin Boxes. Have you child look at the image and say the word; then say again, slowly (one sound at a time), moving a counter into each of the boxes below the image. (Note: the number of sounds in a word don’t always match up to the number of letters. For example, ‘fish’ still has three sounds and therefore when using the Elkonin box, three counters would be moved, one at a time- /f/-/i/-/sh/). Up Words is very similar to Scrabble, however letter tiles can be placed upon one another. This means kids can physically change ‘pen’ into ‘hen’, or ‘ten’ or…even ‘when’. Choose a rime family and confirm with your child what the letters say when together. Make the rime family using magnetic letters or Letter Cards or just by writing it down. Together with your child, add letters to the beginning and discover words (see image below). A variation- try changing the final letter to make a new word. Repeat. Use this CVC spelling sheet to test your child’s knowledge of vowel sounds, or even to monitor their progress in learning them. Read the word to your child and have them spell the word in the space beside. 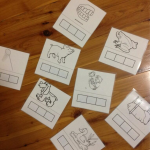 Which vowel sounds does your child know? Which need consolidating? Do you have any CVC word ideas? Let us know below!